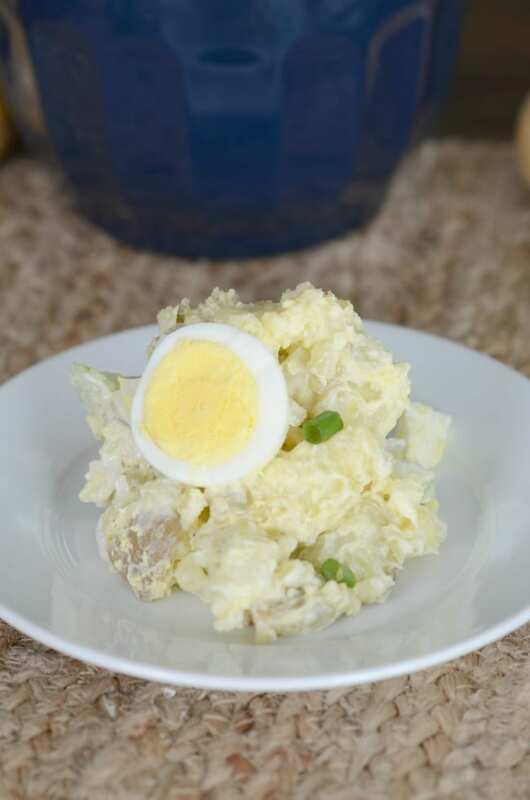 Looking for the best potato salad recipe? 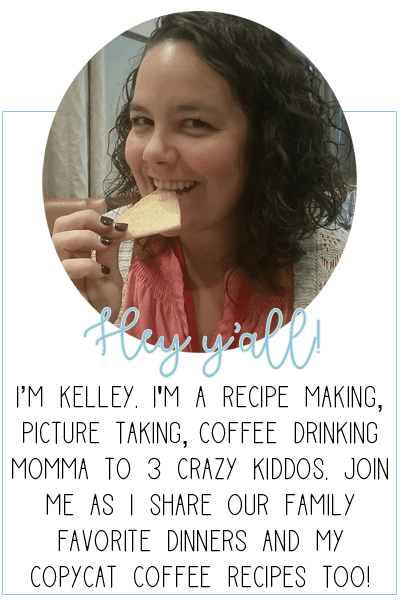 I’m sharing it today and what makes it so unique! This post is sponsored by Great Day Farms from Walmart. All thoughts and opinions are my own. That’s it! One simple question caused a slew of comments on my post. Most of them were genuine and shared what they added to their potato salad recipe. Some even gave great ideas on additions to add in. Then there were some that said they put potato salad right in the trash. Potato salad is the summer food of the gods, yall. It is right up there with macaroni salad to me. It is a summer staple and should be respected. I didn’t realize there was such a divide when it came to potato salad. I just assumed that everyone loved it’s creamy goodness topped with hard boiled eggs. And yes, it needs to be topped with eggs. And have hard boiled eggs in it as well. It’s the way my momma made it and it’s the best potato salad ever. 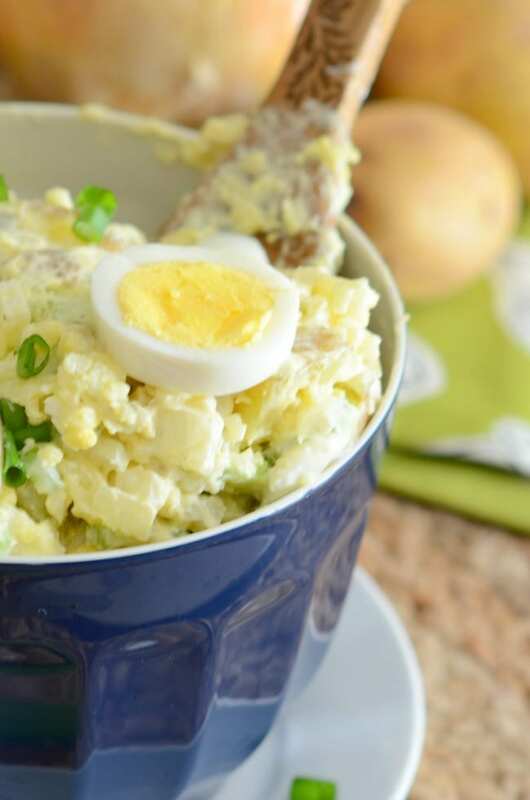 What makes this potato salad recipe the best? 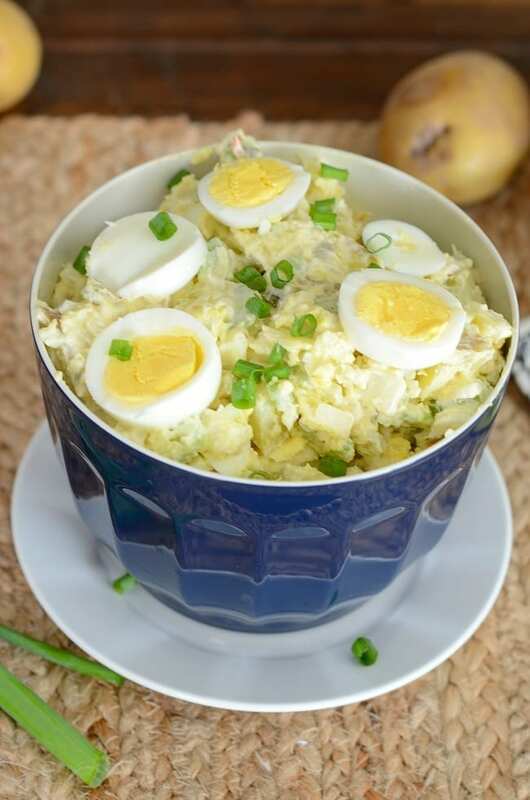 I love adding hard boiled eggs to my potato salad. It makes it extra creamy and gives it a bit more flavor. I used Great Day Farms hard boiled eggs from Wal-Mart for this recipe. They are in the deli section and I loved that I didn’t have to slow down cooking to peel eggs! Some people are against mustard in potato salad, but I love just a splash. The slight tang of the mustard is a great offset to the sweetness of the mayo. In my potato salad I add in onion and celery. 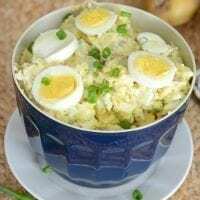 It gives the potato salad a nice crunch and the onion adds some extra flavor to the mix. And of course, fresh chives bring it all together. They are the perfect herb for this easy potato salad recipe. In a large pot, boil the potatoes until fork tender. Remove from heat, drain water and set aside to cool. Mix together the diced onion, celery and the boiled. Chop 3 of the 4 eggs and set them aside. Mix in the mayo, mustard and seasoning. Mix well. Add the chopped egg and give it a good stir. 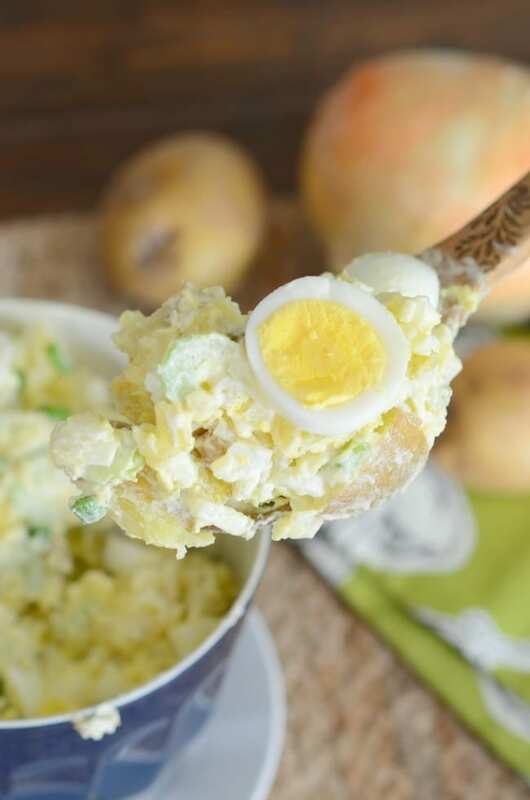 Slice the last egg lengthwise and add it to the top of the potato salad. Place in the fridge for at least an hour before eating. -Do I need to peel the potatoes? Only if you prefer them peeled. I enjoy the skin on so I do not peel my potatoes. If you would like to peel them – go for it! It’s your potato salad. -What kind of potatoes do I use? You can use any potato you like! I like to use either golden potatoes (shown here) or red potatoes. -Can I use Miracle Whip? Sure thing! The ratio stays the same so add in 1/2 cup of Miracle Whip instead of the mayo. -What if I don’t have chives? If you don’t have chives feel free to omit them or use a different herb you do have on hand. Dill makes a great addition! -What if I’m cooking for a crowd? You can double (or triple!) the recipe to make it for a crowd.